France, Germany, Switzerland, and all the other amazing countries in Europe are all closer than they have ever been before and seem more appealing than ever before knowing most are just a quick train or plane ride away! 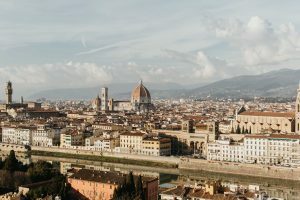 The traveler in me wants to get out and explore all that I can and see all the world has to offer – perhaps that’s how I ended up 5,000 miles away from my home in Florida in Florence, Italy!? But, after overhearing other students in the halls of school and reflecting on my own first few weeks here in Florence, I’ve realized that I have been spending a lot of time in Florence and have only left the city a handful of times for quick day trips. This is something I did not intentionally plan, but I have quickly learned it is something I now cherish and I am very content with. In fact, I absolutely see myself doing more of this. Getting to know Florence inside out is something that is becoming increasingly more important to me. After all, I chose to be here, so why not be here? There is absolutely nothing wrong with traveling while abroad. That is part of the experience and with all that is accessible, it would be crazy not to travel to other countries at some point while abroad. 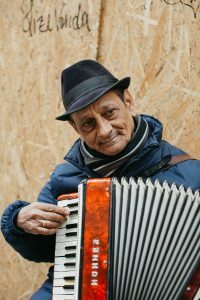 With that said – learning the back ways to the Duomo, finding a new café around every corner, and waving to the man who sits on the corner and plays the accordion every afternoon are things I would never trade for a plane ticket anywhere. Something new around every corner! 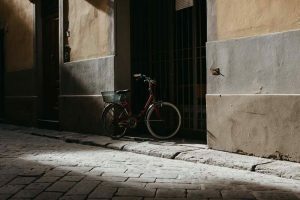 As a photographer, following the light that leaks through the alleys and over the centuries-old buildings of Florence is how I have personally been learning to love Florence. Around every single corner, there is something new to be found whether it is a graphic scene of a bike leaning against a wall with dramatic light or a man on his way home from work, or the breathtaking view of the entirety of Florence with the Duomo dominantly rising above all the terracotta roofs atop the Piazza Michelangelo. Every time I turn a corner or look out a window, there are a million new things happening and they are all so intriguing to me: who does the bike in the alley belong to? Did they ride it to work or do they live there? Did Cosimo de’ Medici walk down this exact street centuries ago? Has the man leaving the building lived in Florence his entire life? Is he visiting, working, or living here? Could this have been where Michelangelo lived? Asking these questions and allowing myself to wonder and create stories for the things I am seeing and photographing are what make Florence feel like home for me. Down each street something simple yet so exciting can be found. While I do plan to travel and I encourage all my fellow classmates (and anyone who may be thinking of studying abroad!) 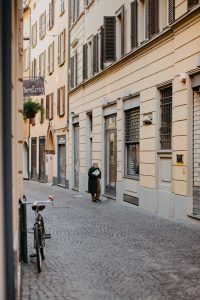 to travel and take advantage of all that is around us – I also encourage everyone to think about spending a good amount of time in Florence, or wherever your host city may be! While it is still the first half of my time here in Florence and I cannot say for certain, I have a pretty good feeling that getting lost and finding my way back without my phone, getting to know the locals around my neighborhood, and capturing my experience here in Florence through my photography will help me continue to love living in Florence.